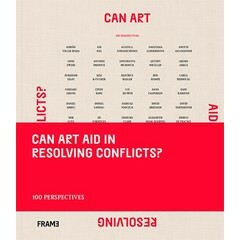 A pioneering survey of leading and emerging global artists, curators and art practitioners on the question: can art aid in conflict resolution and therefore reduce global tensions and human suffering? Throughout the centuries, art has documented the atrocities of wars, participated in propaganda campaigns, and served as an advocate for peace and social justice around the world. The aim of this project is to explore how art can assist in creating dialogue and bridges across cultures and opposing groups. Over 100 leading and emerging architects, artists, curators, choreographers, composers, and directors of art institutions around the globe explore the potentially constructive role of the arts in conflict resolution. A summarizing chapter maps out the diverse positions and examines the variety of themes and approaches that were brought up. Noam Lemelshtrich Latar is Founding Dean of the School of Communications at IDC Herzliya in Israel with a Ph.D. in Communications from MIT, M.Sc. from Stanford, and a BSc in engineering from California State University Northridge. He is the Chair of the Daniel Pearl International Journalism Institute. Jerry Wind is Lauder Professor and Professor of Marketing at the Wharton School and founding Director of the Wharton SEI Center for Advanced Studies in Management, the Wharton Fellows program, the Wharton Future of Advertising Program, and co-founder of the Wharton-QS Reimagine Education program. Ornat Lev-er received a PhD in art history at Ben-Gurion University of the Negev, an MA in Art History from Tel Aviv University, and a BA in Social Behavioral Sciences from the University of Maryland. She founded project that supports the academic studies of students from disadvantaged backgrounds. Dr Lev-er teaches art in the graduate schools of Ben-Gurion University, University of Haifa, and IDC Herzliya.